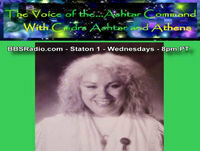 THE VOICE OF THE ASHTAR COMMAND radio shows serve to empower you in acquiring consciousness reference points for your present level of awareness. Self actualization & Spiritual integration enable you to be more effective in serving your Earth mission. Our BBS radio shows are quantum awareness Intensives especially designed to provide deeper insight into your life as an immortal Divine Whole Light Being, your Soul purpose & how to integrate that into your daily life. Various experiential processes, meditations and teachings evoke your Divine knowing and Identity, drawing you into deeper communion with the All That Is. Participate in conscious co-creation within the loving frequency of the Divine worlds within worlds within the meta programs of superluminal Light into which Earth and the Human Life wave is now ascending.